There have been people living in the Peak District – that rugged area at the bottom of the Pennine Way that stretches across Derbyshire, South Yorkshire, Staffordshire and Cheshire – since the Stone Age, and they’ve left their memorials in places like the Iron Age fort at the top of Mam Tor, the Roman lead mines that dot the area, and ancient burial sites. By the Victorian era, with the encroachment of railways, it had become a tourist destination, especially towns like Buxton and Matlock Bath. With so many large cities close by, it was an obvious open space for them to visit. But so much of it was private land. The Kinder Scout Mass Trespass by hikers in 1932 highlighted that problem and began to change public opinion, indirectly leading to the creation of the Peak District National Park – Britain’s first national park – in 1951, covering 555 square miles, and it’s become the second most-visited national park in the world. There’s a lifetime’s worth of walking in the Peak District, whether it’s from Hathersage out along the Hope Valley, the sharp climbs of Jacob’s Ladder or Grindsbrook Fell, or through the Derbyshire Dales that surround Bakewell. There are, in fact, two Peak Districts, the Dark Peak, which is gritstone, and the limestone White Peak, the former more barren and made up of peat moorland, while the latter hosts a lot of farms. Some of the abandoned railway lines have been rehabilitated as walking trails and offer spending hiking, such as the spectacular bridge that spans Monsal Dale. Then there are the edges, the gritstone outcrops so popular with climbers – the Peaks are full of them on weekends – that provide great views and walks, out along Stanage Edge (also perfect for clambering over nearby Higger Tor), or Froggatt and Curbar Edges, while for those who want a flatter stroll, several reservoirs, like Carsington Water, Derwent Reservoir or Ladybower offer a very pleasant, easy day out. If you’re in the mood for a daintier time, then try some of the attractions – Chatsworth and Hardwick Hall – in the area, or Castleton hosts some caves, the Peak Cavern, Speedwell (where the boat trip is worth the price of admission) and a short hike takes you out to Blue John Cavern, where they still mine the Blue John fluorospar – and from there go up to Mam Tor and along the ridge that separates the Hope Valley from Edale, all the way to Losehill, giving wonderful views on both sides (or walk back down the stunning Winnat’s Pass). With millions of people visiting the Park annually, especially in the summer, issues about conservation have inevitably cropped up. A carelessly discarded cigarette can cause a fire that destroys acres of peat in the Dark Peak, while the sheer numbers of users have caused erosion of footpaths, and even caused the start of the Pennine Way to be shifted from the earth paths of Grindsbrook Fell out to the stone of Jacob’s Ladder, a mile away. More mountain bikers have contributed to the problem. They’re allowed on bridleways, but some have been using footpaths and making erosion problems worse. 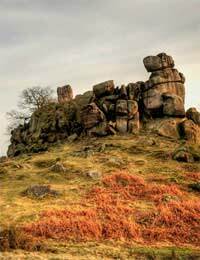 The ongoing conservation policies, especially on National Trust land like the Longshaw and High Peak Estates, are working to reverse the damage, but it will be a long process. With so many people close by (20 million live less than an hour’s drive from the Park) it might seem as if it would be impossible to find stretches of countryside not full of people. But head out early on a Saturday morning and you can sometimes cover miles without seeing another person. From the spare, stark beauty of the moors to the lush green valleys, it offers everything to a hiker. please can you offer some advice? my brother & I are interested in doing the following. Castleton hosts some caves, the Peak Cavern, Speedwell (where the boat trip is worth the price of admission) and a short hike takes you out to Blue John Cavern, where they still mine the Blue John fluorospar – and from there go up to Mam Tor and along the ridge that separates the Hope Valley from Edale, all the way to Losehill, giving wonderful views on both sides (or walk back down the stunning Winnat’s Pass). We are looking at visiting one Saturday late October - early November, what is the admission? How do we proceed in organising this day? Do we drive to one specific area to start the walk& would we need maps or a guide? thanks. I think it's one of the most beautiful parts of England and you can see almost every type of scenery within the space of a few miles. That said, you probably don't want to go up on Snake Pass in winter unless you absolutely have to, and when it rains up on the peaks, it really comes down like stair rods. And respect to anyone who can go round Ringing Roger, over the tops and down Grindsbrook Fell in less that three hours!